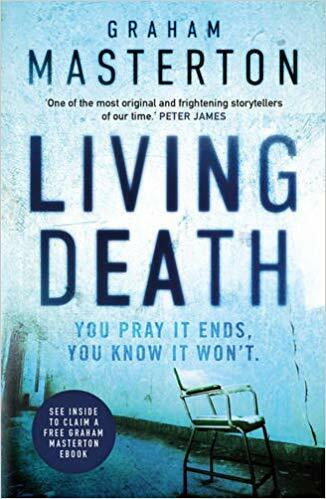 Living Death is the seventh book in the Katie Maguire series of police procedurals set in Ireland. Katie Maguire is a high ranking detective in the Cork Garda and at the start of the book she begins an investigation into a break in at boarding kennels and the disappearance of a large number of dogs. During the break in the owners wife is raped and one of the perpetrators shot dead, which turns a simple case of dognapping into a murder investigation. Meanwhile a young woman, Siobhan, is abducted from outside of a nightclub and forced to endure horrific mutilation by the surgeon of a private clinic, the details of which are pretty gruesome. Siobhan isn’t the only one to go missing and as the book progresses the number of patients admitted to the clinic grows, each trying to cope with the unnecessary loss of sight, limbs and speech. In contrast to the unnecessary mutilation of the victims, at home Katie is struggling to cope with having an ex-lover who has come to stay after the recent amputation of his legs, a situation she feels responsible for. The ex-lover is needy and trying to come to terms with the loss of his legs. He desperately tries to rekindle their relationship as if this will somehow make up for the loss. With human mutilation and animal cruelty at it’s worst, this is not a book for everyone. However Living Death is full of light and shade with empathy and tenderness balancing the horror. Graham Masterton cleverly shows the manic lifestyle of a high ranking police officer. The mountain of paperwork and bureaucracy, as well as the day to day running of an investigation, and how it all impacts on a policewoman’s life. This is a book of twists and turns, and threads that brilliantly weave throughout the book. No element is superfluous to the plot and there are surprises up to the very last page.